1.Lightweight high quality mini backpack with cute pattern, great for 2-5 years old kids using as a school bag. 2. It is enough room to store snack and drinks in it when your kids go on a trip, or hold books when children go to kindergarten. 3.Breathable and comfortable, sponge mesh material to ease kids back and shoulder, Adjustable padded shoulder straps for cushioned comfort. 1.within 1cm error of measuring is a reasonable range due to different measurement methods. 2.The actual colour of the backpack maybe different from the picture shown due to the different screen of display or reflecting light when shooting. 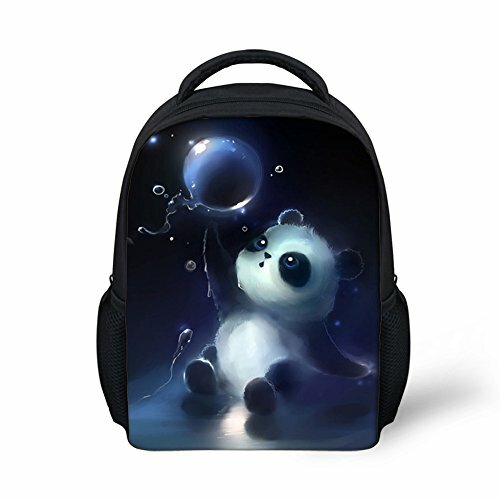 Small Backpack: This cute mini bag is a best gift for 2 to 5 years old kids. Suitable for a preschooler or kindergarten baby. Main Material:300D Polyester. Lightweight and durable. Dimension: 10"(L) x 12"(H) x 4"(W). This toddler backpack is with a roomy main compartment to stores the kids' toys, diaper, book, snack and other stuff. Cute Pattern: There is a unique pattern printed in the front of every toddler backpack, cool and attractive. Practical Design: one main zipper pocket, easy to open and close. Two mesh side pockets for small toys or snacks. Adjustable comfy straps and soft top handle for carrying comfort. The lining on the back is mesh so it will allow air to circulate and help reduce sweat forming on their back if worn for extended periods. Occasion: Fashion personalized small backpack suitable for kindergarten baby bag to school, outdoor travel. It is also s a toys bag or a lunch bag, really a very good gift for kids. If you have any questions about this product by Dellukee, contact us by completing and submitting the form below. If you are looking for a specif part number, please include it with your message.